Parsley root is related to parsnips, a beige carrot like root with a carrot-celery flavor, but should not be confused with parsnips, even though they look very similar. 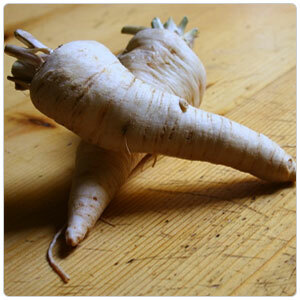 Unlike parsnips, parsley root is not sweet; its flavor is aggressive and earthy with hints of celery root and parsley. Parsley root adds depth to soups, stocks, braises; adds hints of celery and parsnip to mashed potatoes and plays well with other root vegetables. The leaves of parsley root can be used in the same manner as flat leaf parsley, but has a mild to spicy, cress-like flavor.